Summer is nearly here and that means sunny days at the beach, pool or even just in your yard. Sunscreens make lots of claims on what they block - but are they really as great as they claim to be? With roughly 1,400 various sunscreens on the market, it is hard to determine which is the best and safest for you and your family. 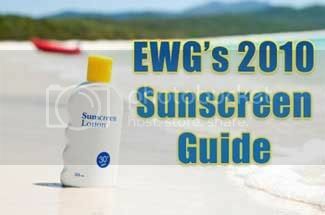 The Environmental Working Group has put together their 2010 Sunscreen Guide to help choose the best sunscreen. Not only can you check the toxicity of your brand but also see if it as affective at blocking dangerous sun rays. There is a nifty search feature that will let you pull up a specific sunscreen and look at its rating. (see widget below) They also have a list of the best and worst sunscreens out there. So, bBefore you lather the sunscreen on this summer, I highly recommend you check out this guide and get yourself a quality product!